LONG hours in the summer, ensuring a pre-planned fertiliser programme is on target and achieving the right aeration balance - you could consider all of the above to be traits required by one of Wiltshire's many farmers. 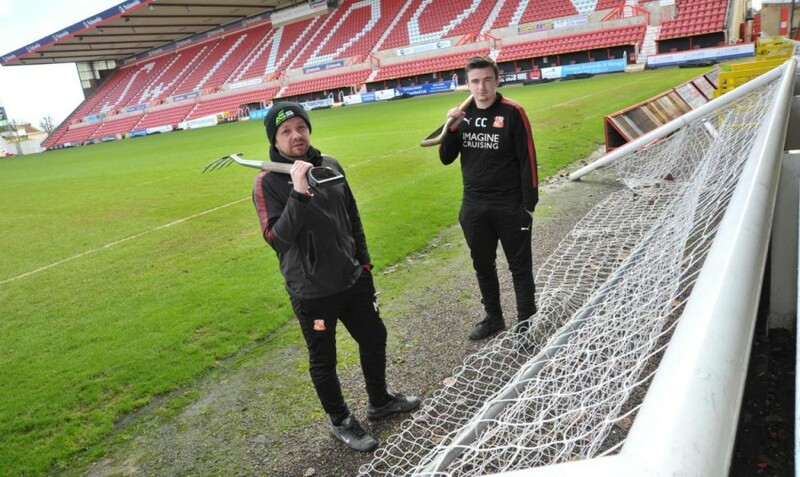 But it also applies to Swindon Town's chief groundsman Marcus Cassidy, who is midway through his 18th season at the club. It's a job that started for the Stonehouse-born groundsman by chance after he landed the role through a friend before completing various courses to expand his qualifications. He now works alongside apprentice Conor Collins - who spends his Saturday's working on Southampton's pitch - while using an army of 10 volunteers to ensure the pitch is prepared to perfection ahead of matchday. A fortnight ago on Saturday proved a rare occurrence for Cassidy as Town's home game against Forest Green Rovers was postponed due to heavy snowfall. But it was only dangerous conditions around the perimeter of the Energy Check County Ground that forced the game off - with the club deeming the pitch as fit to play on. "Snow is a great insulator," explained Cassidy. "So if the ground isn't frozen, the snow will keep the frost out - and vice-versa. Our pitch is a very old pitch, it's essentially a sand and soil pitch. Premier League, Championship and even some pitches in League Two are hybrid - they are three to five per cent plastic." Cassidy has every right to claim the County Ground as one of the truest pitches in League Two, and he pinned that down to the investment provided by chairman Lee Power and chief executive Steve Anderson. While he accepts he is a way off having the tools Premier League staff have to their disposal, Cassidy revealed the club is more than half way there to being home to world-class equipment used by top teams including Manchester City, Barcelona and Bayern Munich. He added: "The club has invested in the machinery that I can use in the last three years. That makes things a lot easier. When you're waiting on contractors, they might not be able to get there or might be on another job." "With the tools I've got, I can go out and do what I want, when I want. That's why the pitch is holding up well, because the club has invested. I'm always asking for more equipment. In the Premiership, they get what tools they want." "We try and improve a little bit each year. I'm under no illusions, when you get relegated into League Two budgets will be cut. But Steve Anderson and Lee Power do try and keep the pitch to the standard it is. They expect a good pitch, and they want a good pitch. It's a slow process - I'll always ask for more than I can get. They can only say no." Watching the game often comes second on Cassidy's list, who has his eyes on the ball more than anything else come 3pm on Saturday. And you can rest assured he and his hard-working team of staff have put the hours in ahead of Town's next home game against Grimsby Town tomorrow. "You try and watch the game, but I'm watching the ball more than anything," said Cassidy. "I want to see the ball rolling well. When I watch the highlights, I'll watch them twice - I study the pitch first and then the goals. It's pretty sad, but that's my job. We do less hours in the winter - sometimes you just leave it alone. You can do more damage by overworking a pitch. Less is more in the winter."